Rabbi Orrin Krublit is serving as the Assistant Rabbi at Congregation B’nai Amoona. Rabbi Krublit previously served the congregation as the Rabbi Bernard Lipnick Rabbinic Intern for three years. 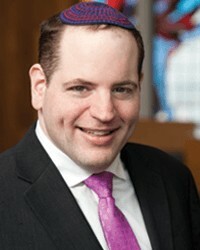 Rabbi Krublit received Rabbinic Ordination at the Jewish Theological Seminary, as well as a M.A. in Jewish Education in May, 2017, and lives in St. Louis with his wife, Meira Cohen. Rabbi Krublit was raised in Orlando, Florida as well as having spent many years in Greensboro, North Carolina at the American Hebrew Academy - the nation’s first Jewish Pluralistic Boarding High School. After receiving a bachelor’s degree in Judaic Studies from the University of Florida, Rabbi Krublit returned to the Academy to serve as a Fellow before attending Rabbinical School. Edward M. Geltman is a Professor of Medicine and Assistant Professor of Radiology at Washington University in St. Louis. Dr. Geltman received his bachelor’s degree in Biology from the Massachusetts Institute of Technology in 1967 and his M.D. from New York University in 1971. He completed his internship and residency in Internal Medicine at Bellevue Hospital Center in New York. His Cardiology Fellowship was performed at Washington University. Dr. Geltman served in the United States Air Force from 1974-76, during which time he trained physician assistants and nurse PR actioners, and held an appointment as Instructor of Internal Medicine at the University of Nebraska, School of Medicine. He joined the faculty of Washington University as an Instructor of Internal Medicine in July, 1978 and rose to the rank of Professor. Dr. Geltman’s early work focused on the assessment of prognostic markers in patients recovering from acute myocardial infarction with emphasis on the effects of enzymatically determined infarct size. He subsequently collaborated with members of the Divisions of Nuclear Medicine and Radiation Sciences as new techniques were being developed, validated and implemented for imaging of cardiac function, perfusion and metabolism. He worked extensively with positron emission tomography using C-11 palmitate and C-11 acetate to assess patients with acute myocardial infarction and dilated cardiomyopathy. In addition he studied methods for the quantitative assessment of myocardial blood flow using O-15 water and O-15 carbon monoxide. These techniques were employed to detect mechanically dysfunctional myocardium with the potential for return of function after revascularization. He also helped to understand the role of reduced myocardial perfusion reserve in patients with chest pain and angiographically normal coronary arteries. Dr. Geltman’s work on prognostic indicators led him to become involved in large multicenter trials in patients with coronary disease and congestive heart failure. He held leadership roles in the SAVE study which demonstrated the beneficial effects of ACE Inhibition in patients with myocardial infarction and reduced systolic function, and the MACH 1 trial which investigated the effects of a novel calcium channel blocker, mibefradil, in patients with congestive heart failure. He has been involved in numerous other trials of other ACEIs, ARBs and other promising agents for the treatment of patients with congestive heart failure. Throughout his time at Washington University, he has been active in the direct care of patients with a wide variety of cardiac conditions, although he has focused on those with congestive heart failure over the past 20 years. He has been a dedicated and enthusiastic bedside clinical teacher. Dr. Geltman has published numerous peer-reviewed papers in top scientific journals, and multiple invited reviews and book chapters. He has won awards for his research from the American Heart Association, Missouri Affiliate, along with its most prestigious, Hugh D. McCulloch Award. He was given the Lifetime Achievement Award by the Barnes-Jewish Hospital Society in 2014. Lynnsie Balk Kantor is an active volunteer in the Jewish community, having served on various boards and committees at Solomon Schechter, Mirowitz, B’nai Amoona, the Jewish Federation, JCRC’s Student to Student program, and Nishmah. She has chaired two Bnai Amoona family trips to Israel. Professionally she has worked as National Educational Director of Young Judaea, parent educator for Our Jewish Home, program director for Washington University Hillel. and, for the past 18 years, as a residential real estate agent. She has a master’s in Dance Education from NYU and has taught dance, especially Israeli folk dance, to people of all ages. Her greatest accomplishments are her three children, ages 28, 26 and 23. I grew up in the town of Westbury New York on Long Island, a suburb located twenty five miles from New York City. I was very active in high school with various sports - namely baseball and wrestling. In high school I won an award in a local science fair for a project involving photo micrography of daylily reproduction. I attended Washington University graduating with an Engineering degree in 1964. In 1966 I graduated with an MBA from Cornell Graduate School of Business. I lived in Kansas City for fifteen years doing computer and business consulting work. I worked for ten years with a business startup that became an international remote computing service business. The desktop computer eventually put the company out of business. Madelyn and I met on a blind date in Chicago. We have two children Jennifer and Matthew who are married and now live in Bethesda Maryland and Missoula Montana respectively. We have four grandchildren Aviva, Isaac, Solomon and Sylvie. I worked as a computer consultant for more than twelve years with Brown Smith Wallace. Much of this time was spent working with manufacturer groups and distributors to create standards for economic commerce that made it easier for trading partners to do business together. I worked with the paper industry, food equipment, and embellished activewear industries. For fun , I have many interests. While living in Kansas City I became a serious sailer racing my one design 16 foot sailboat in hundreds of races. I trailered my boat behind my Volvo to many national and a few international regatta’s. Often Madelyn and our two young children would travel in the two door Volvo with me to the weekend and week long sailing events in different parts of the country. I am a serious photographer. I played racketball for more than fifteen years at the J with Rabbi Lipnick and other friends. I enjoy reading and politics. I also enjoy working out at the JCC and biking with friends. Madelyn and I recently lived in Missoula Montana. We really enjoyed living in a small town in the American west. We enjoyed traveling to many national parks including Glacier, Yellowstone and the Teton National parks. I learned to fly fish on some of the best flyfishing rivers in the US. I served on the Executive board of B’nai Amoona and the Board of Directors of the St. Louis JCC. I was very involved in getting the J to have at least six racquetball courts and to renovate the J West. In January 2018 my doctor after looking at the results of a routine blood test, recommended I see a nephrologist at Barnes Jewish Hospital to determine why my creatine number was so high. The nephrologist said I was developing kidney disease and we needed to follow this going forward. My kidney function continued to decline over the next few months. I made the decision to see whether I could get on the national transplant list. This took three months of education and testing at Barnes by the transplant team. After being put on the transplant list, my daughter volunteered to see if she could donate one of her kidneys to me. On October 9, 2018, at Barnes Jewish Hospital, the kidney transplant team removed one of Jennifer’s kidneys and put it in my body. That was two months ago. I am happy to say all is going well for both of us.